Home Switcher for Froyo is a free app for your Android phone running Frozen Yogurt (Android 2.2) or above. It is an app that makes switching between two different Launcher programs very simple. Launchers are the main interface for the Android operating system. It’s how you interact with your device. While most people will never switch away from the factory default launcher their phone comes with, there are still many people who love to play with different launchers. Some can make your phone look more like an iPhone, or Windows Phone 7. 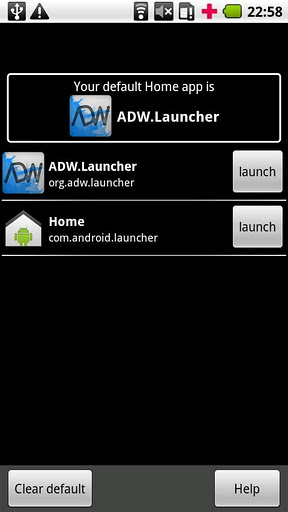 Some offer more customizability and themse, like ADW.Launcher, and some offer better performance, like LauncherPro. But sometimes when you’re just playing with a new launcher, or you’re trying to find out the best launcher for you, you need to switch back and forth between them. Home Switcher makes it very simple to do that, and I encourage anyone using multiple launchers to make sure they have this installed. Even though “for Froyo” is in the name of the application, I have confirmed that it works up to Gingerbread 2.3.3. It most likely works with even newer versions of the Android Operating System, but I can personally confirm FroYo and Gingerbread are compatible with this application. Cannot sign or encrypt this message certificate error when sending from Outlook solved! NuAngel is officially a teenager!